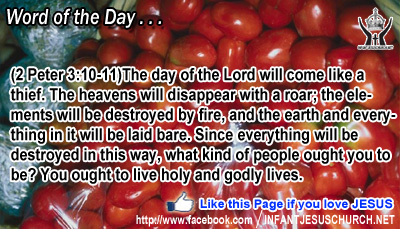 2 Peter 3:10-11: The day of the Lord will come like a thief. The heavens will disappear with a roar; the elements will be destroyed by fire, and the earth and everything in it will be laid bare. Since everything will be destroyed in this way, what kind of people ought you to be? You ought to live holy and godly lives. Holy and Righteous Father, teach us to do your will and reflect your character while offering your grace to others. May the movements of our heart, the thoughts of our mind, and the actions of our life be pleasing to you and reflect your holiness and grace. In Infant Jesus' name we pray. Amen. 18As he walked by the Sea of Galilee, he saw two brothers, Simon who is called Peter and Andrew his brother, casting a net into the sea; for they were fishermen. 19And he said to them, "Follow me, and I will make you fishers of men." 20Immediately they left their nets and followed him. 21And going on from there he saw two other brothers, James the son of Zebedee and John his brother, in the boat with Zebedee their father, mending their nets, and he called them. 22Immediately they left the boat and their father, and followed him. Jesus speaks the same significance to us today: we will "catch people" for the kingdom of God if we allow the light of Jesus Christ to shine through us. God wants others to see the light of Christ in us in the manner we live, speak, and witness the joy of the gospel. Paul the Apostles says, "But thanks be to God, who in Christ Jesus always guides us in triumph, and through us spreads the perfume of the knowledge of him all over the place. For we are the aroma of Christ to God among those who are being saved and among those who are inclement. Do we show others about you the joy of the gospel and do you pray for your neighbors, co-workers, and relatives that they may come to distinguish the Lord Jesus Christ and grow in the knowledge of his love? Loving Infant Jesus, you have called us personally by name, just as you called your first disciples, Simon, Andrew, and James. Fill us with the joy of your gospel and help us to be a good and honest witness of your kingdom to all we meet.